BUY GOLD prices held around last week’s 2-year closing high in Dollar terms Wednesday morning as the US currency slipped on the forex market and world stockmarkets extended their rally from last week’s Brexit bombshell. Commodity prices rose 0.7% on average, and the single Euro currency edged up towards $1.11 as the Dollar fell, rallying 2 cents from this week’s new 3-month low. London’s largest 100 shares had by lunchtime recovered three-quarters of Friday-to-Monday’s 5.6% plunge, but the more UK-focused FTSE250 index remained almost 9% below its pre-Brexit level. The Pound Sterling meantime rallied above $1.34, regaining 3 cents from Monday night’s new 31-year low but still holding a drop of more than one-tenth. That curbed prices to buy gold with British Pounds at £980 per ounce, some 2.6% above Brexit Friday‘s afternoon benchmark of £955 – the highest Friday finish since April 2013 – as UK government Gilt yields held at record lows beneath 1.0% per year. Economists now put the UK’s forecast 2017 GDP growth at 0.4% on average, down from a 2.1% average forecast a fortnight ago, according to Consensus Economics. “The mildly up sloping channel on [gold’s] daily chart at $1315/$1307, which also happens to be the inverted Head and Shoulder confirmation level, will be a test of character,” says Stéphanie Aymes’ technical analysis team at French investment and London bullion market-maker Société Générale. Looking at the fundamentals, “We believe that Britain’s forthcoming exit from the EU will, on balance, remain positive” for investors choosing to buy gold, says the latest weekly note from specialist analysts Metals Focus. The US Federal Reserve shows zero chance of raising its key lending rate from the current 0.5% until November at the earliest, according to betting on interest-rate futures contracts Wednesday morning. “If Brexit is used as an excuse,” said legendary ‘contrarian’ investor Marc Faber to Bloomberg in Hong Kong overnight, “the central banks will print more money, QE4 in the US is on the way, and the depreciation in the purchasing power of currencies will continue. 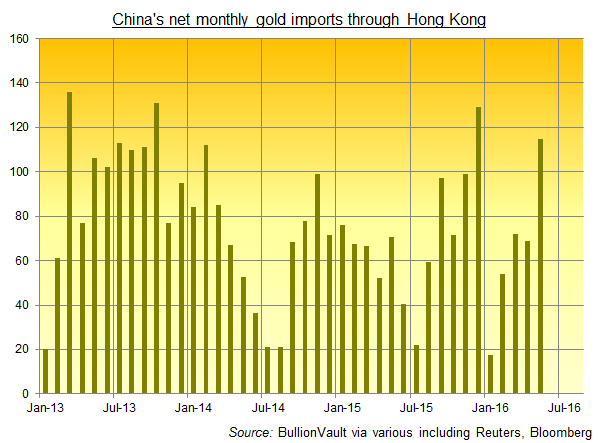 China’s demand to buy gold – now the heaviest in the world, overtaking India – saw imports through Hong Kong jump in May to a net 115 tonnes. That took the running 12-month total to 846 tonnes, the fastest annualized inflows so far in 2016. Weighing over 51% more than the last 3 years’ monthly average, it was also the largest June inflow from Hong Kong to China since at least 2011 on available data. Indian households wanting to buy gold are currently finding up to 5% discounts below world prices thanks to an increase in smuggling to avoid import duty and sales tax, reports the Business Standard. Legal supplies are trading at 2.5% discounts.